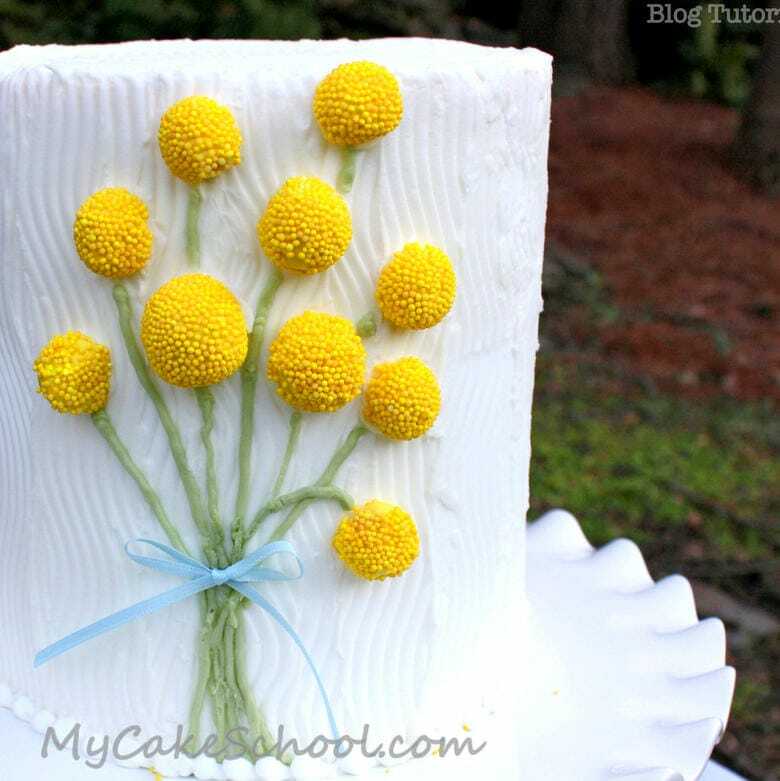 Hi everyone–this may be the easiest flower tutorial that you’ll find on our site. I frosted a 6 inch double barrel cake with vanilla buttercream today and it’s the perfect backdrop for some billy ball cuteness. Ready to make some flowers? 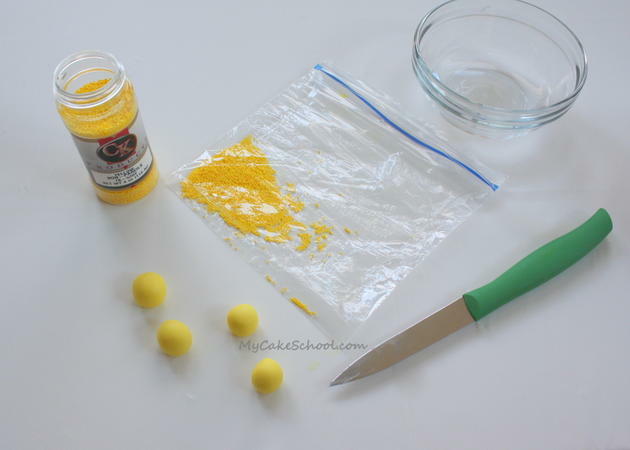 First, you’ll need some yellow balls of fondant (I tinted my white Satin Ice fondant with Americolor Lemon Yellow). 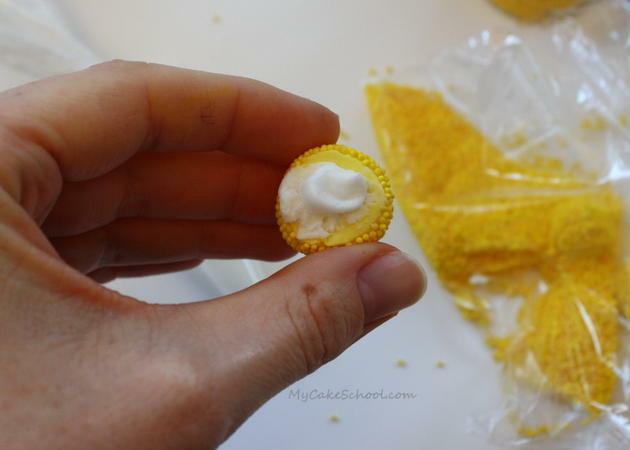 You’ll also need a sharp knife, a little water, and some yellow nonpareils. Mine are CK brand. You’ll need a ziplock or plastic bag too. 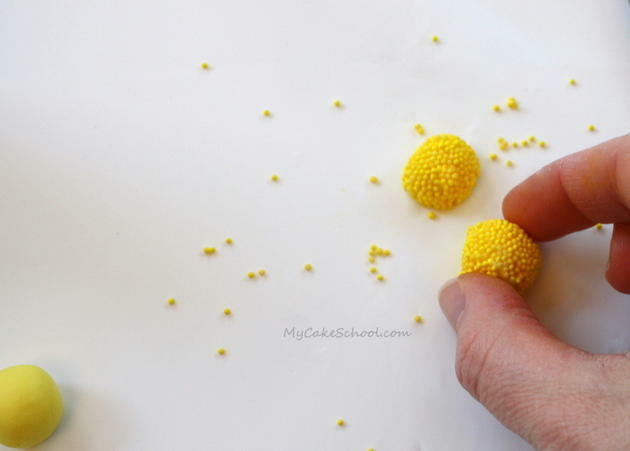 One at a time, I took the fondant balls and dampened them with a little water. 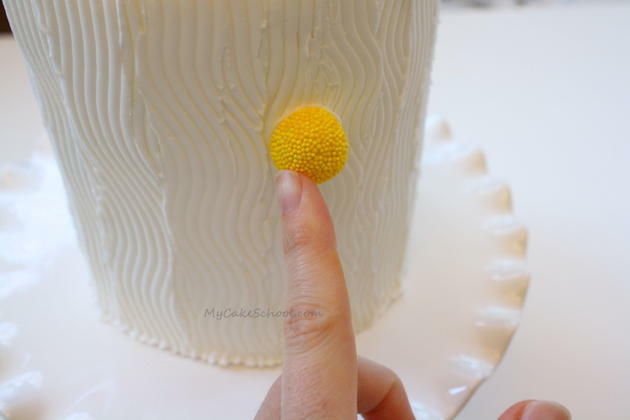 Then rolled the ball in my palms to make sure that the dampness covered every part of the fondant. This creates a stickiness that acts as an adhesive for our next step. Just a small amount of dampness should do the trick. 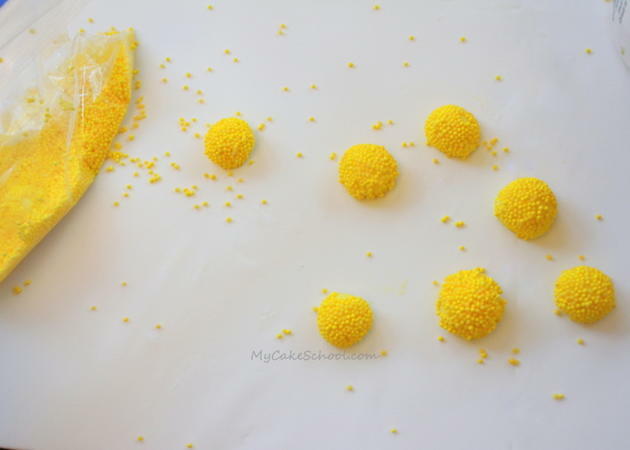 Next, I shook the ball of fondant in a bag of yellow nonpareils until covered. Next, I gently sawed the ball of fondant in half. 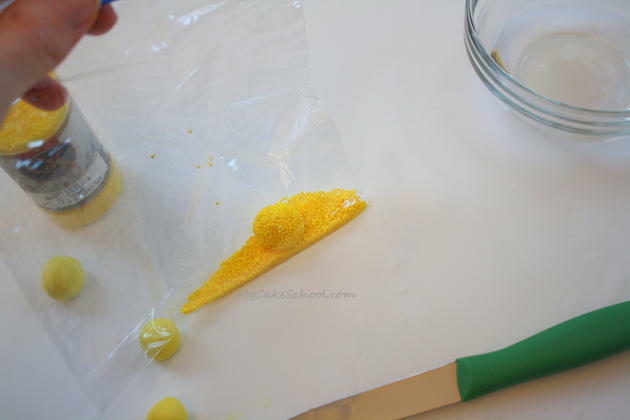 (By the way, you could do this step first and then shake the halved balls in the sprinkle bag….but I preferred doing it after.) 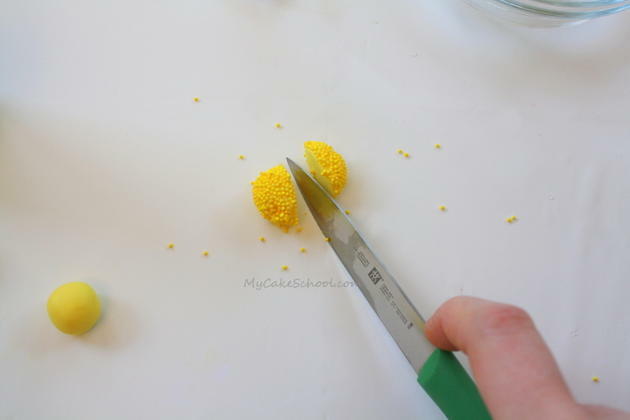 Sawing them in half makes them more lightweight and will also give you more surface area for you to use to adhere the billy balls to the cake. After sawing your billy balls you may have to slightly reshape them to restore the roundness, since the fondant will still be a little soft. Here I am combing my cake with my favorite Ateco cake comb. I’m using the side with the smallest teeth, and just combing vertically, section by section. 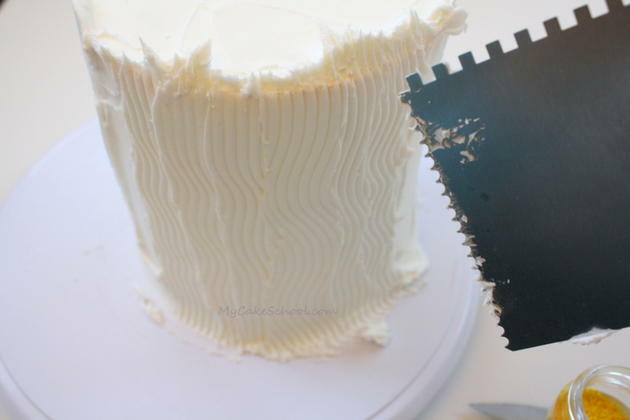 I cut away the excess frosting around the top edge of the cake with my knife. 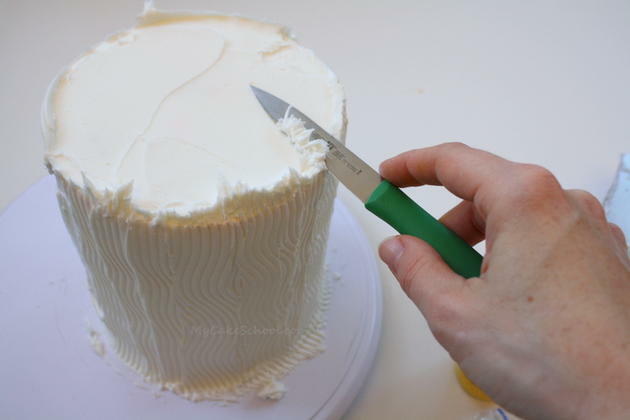 Then, I combed the top of the cake too. Now, for the best part of all…building the bouquet! A little fresh buttercream is all that we need to adhere the billy balls to the cake. 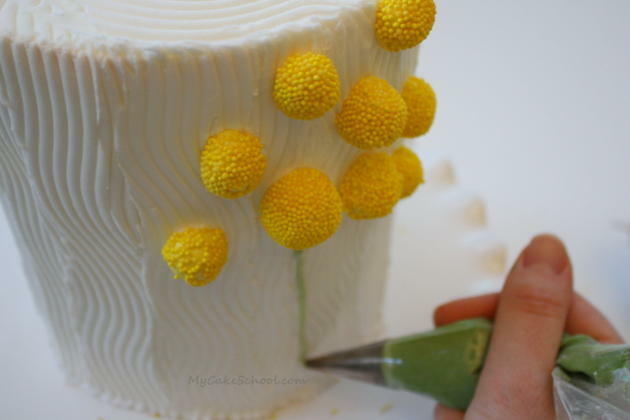 After applying the flowers to the cake, I piped several stems using some buttercream (tinted with Americolor Avocado Green), and using a Wilton Piping Tip 3. I hope that you enjoyed this tutorial! 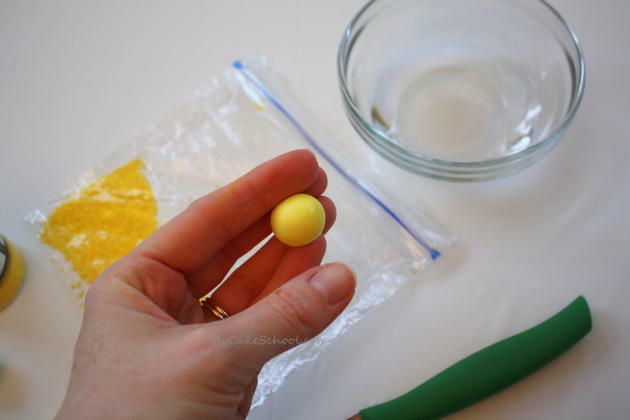 Remember these billy balls when you are looking for something sweet and cheerful. I just love the country chic feel that they add, and they would be perfect for just about any occasion from birthdays to bridal showers. Have fun experimenting with this design and designs of your own–see you next time! Three Cheers for Sweets on Sticks! Fondant Ruffle Rose Cake- Free Tutorial! 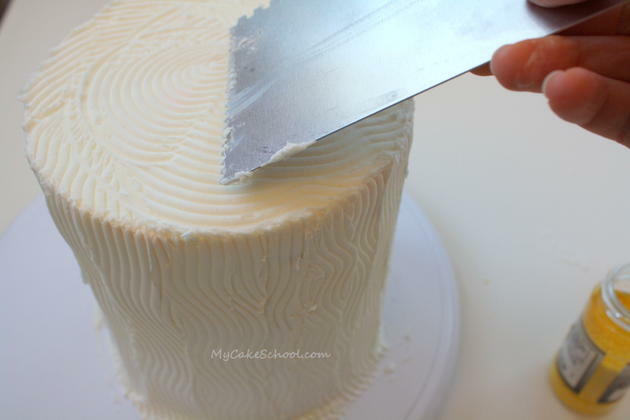 What is the size of the cake rounds for this cake and how many layers? This is gorgeous but I have to be HONEST, I laughed pretty hard at the name Billy Balls – but then again, I behave like 10 yr old boy sometimes. @Emon- These are 6″ cake layers– 2 layers, cake board (with supports beneath) and two more layers. The cake is approximately 7 inches tall, but this design would be cute on any size cake! Melissa, I get so excited when a notice comes in my email that you have something new to show us ! ….you never disappoint me ! I so love these little yellow flowers ! I need to tell you once again how great of a teacher you are….you have a way of explaining ideas and techniques that makes me want to do whatever the new project is..immediately..thank you for that.:). can’t wait for the next one. This is so pretty! Not only have I never heard of Billy Balls, I’ve never even seen them before looking at the picture from the link that you posted. 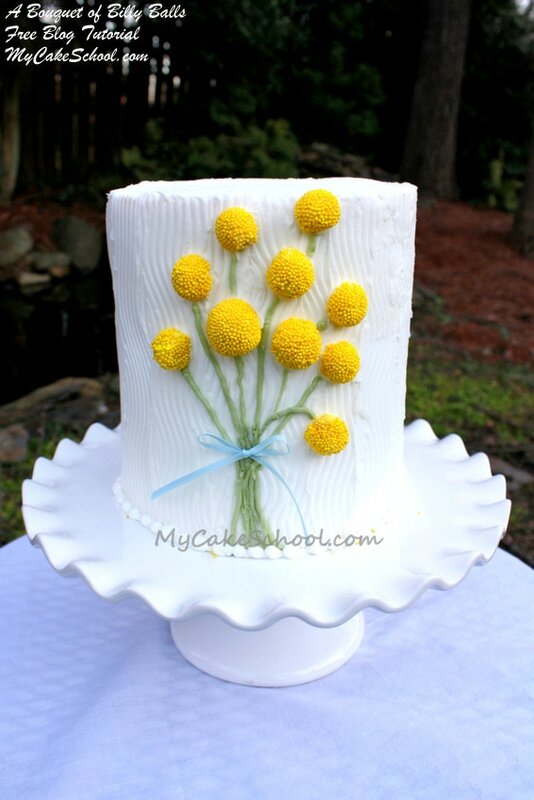 I love the simplicity and beauty of this cake! !